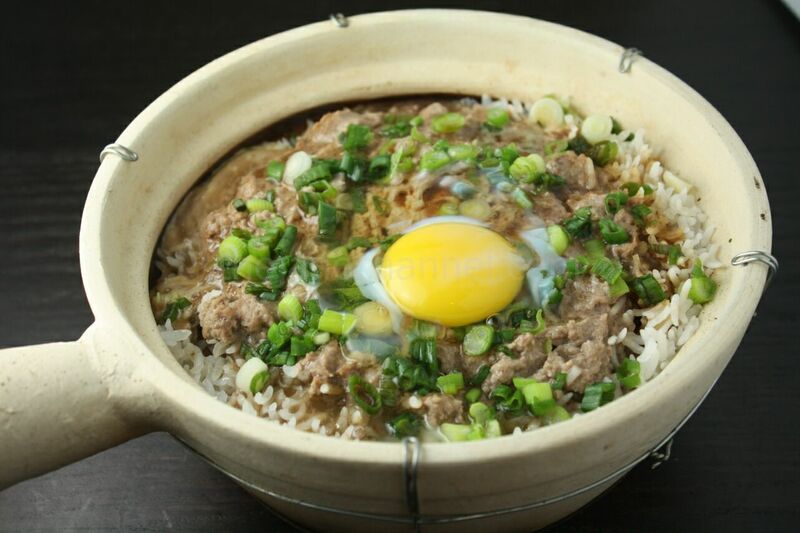 A steaming hot minced beef with a runny egg on top over rice. This may be the easiest dish to make ever, with (almost) no chopping and no frying. Just marinate the beef and crack an egg on top after cooking. 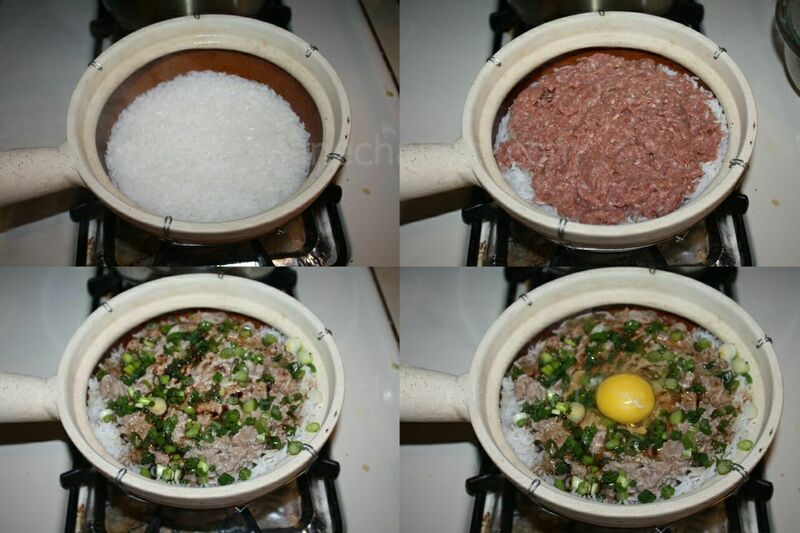 If you do not have a clay pot, you can use an electric rice cooker. Add the beef when the rice is 70-80% done, cover and let the beef cook. 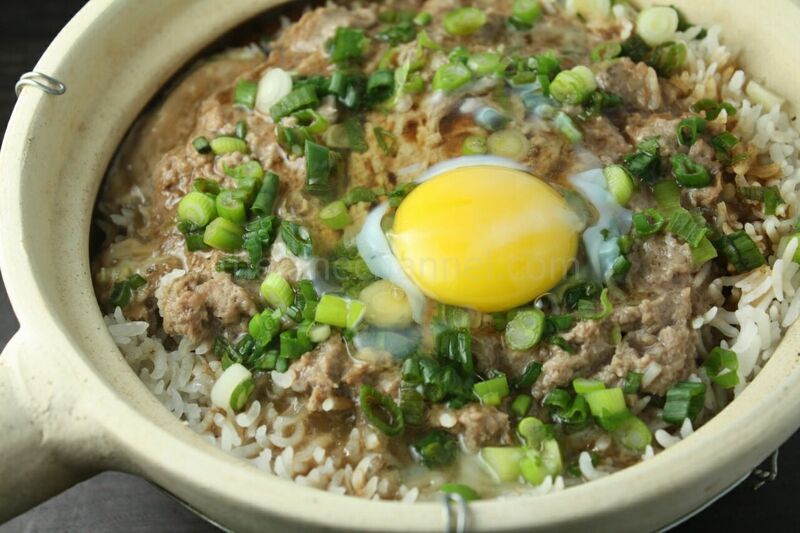 The rice, after being combined with the juices from the beef, egg and sweet soy sauce, is just as good as the nice and soft minced beef itself. Combine beef with soy sauce, oyster sauce, ginger, sugar, sesame oil and water, marinate for 30 minutes. Thinly oil the inside of the claypot. (Apply oil to the pot before adding rice and water to avoid sticking and to make a crispy rice effect) Heat over medium-high heat. Add the rice and water and cover. Bring it to boil, then lower the heat and simmer for 5-7 minutes. Turn the heat to high and add beef and then cook over low heat for 13-15 minutes. Turn off the heat and cover for another 10 minutes or until beef is cooked. Add scallions and drizzle sweet soy sauce mixture over the rice. Then crack an egg on top and cover for 1 min. Mix in the egg and allow the heat of from the rice and clay pot to slightly cook it. If you like your egg to be more cooked, add it in right after you turn off the heat.